About a year, maybe 18 months ago, I got a facebook friend request from a guy named Andrew Curry. I don’t know Andrew and, that being the case, I would never have bothered to “friend” him. But, Andrew wrote me a particularly nice note. While I had no idea why he would want to friend me, I went ahead and accepted it. I still don’t know Andrew but I see that he knows many of my Facebook friends, as evidenced by a new CD that lists him as executive producer. 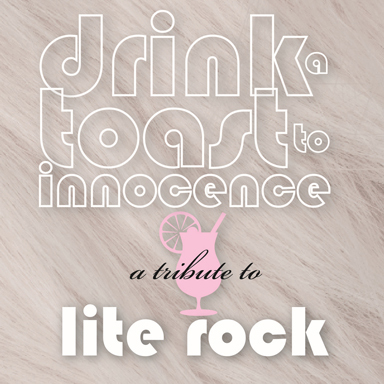 The disc entitled Drink a Toast to Innocence, a Tribute to Lite Rock is a collection of lite rock tunes from the late 70’s and early 80’s “reimagined and reinterpreted by some of the best indie pop artists of today”. Not only has Curry managed to put together a disc of some of the most memorable songs of my youth (and his, I’m sure), but he has assembled some of today’s finest powerpop talent. There are 28 tracks in all (count ’em, 28!!) and its fair to say that while some are more enjoyable than others, there are no clunkers. And that’s as much a testament to the songwriters and the talent performing them. 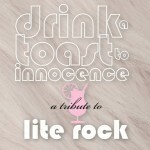 There are too many tracks to give a comprehensive overview but I’d like to touch on some of my favorites. David Myhr doesn’t deviate much from 10cc’s “The Things We Do for Love” and why would he. It’s a fantastic song and Myhr gives an excellent performance. Mike Reukberg of Rex Daisy and The Red Button fame chose to perform Joey Scarbury’s “Believe it or Not” and actually improved on the original. Eytan Mursky gave “The Pina Colada Song” the farfisa treatment and Bleu (The Major Labels, Popfilter) offers up a straightforward version of Player’s “Baby Come Back” which blows away the original. Lannie Flower’s interpretation of “Dance With Me” was tons of fun and Seth Swirsky, the other half of The Red Button, does an impressive good job with the falsetto vocals on “Shannon”. This is a great choice of song, as both Henry Gross and Swirsky are huge Brian Wilson fans. My favorite cut on the record though, is by Sunshine on Mars, an act I’m unfamiliar with. No matter as they had the good taste to chose to perform one of my favorite songs of the 70’s, Elvin Bishop’s “Fooled Around and Fell in Love”. I’m Andrew Curry’s mother, and I loved your review! I also love the CD even though I was a young mother with three sons back in the 70s and 80s–too busy to listen to music much then. Oddly enough, I can still sing along with many of the songs in the album. I learned a little more about Andrew’s project from you. Thanks.